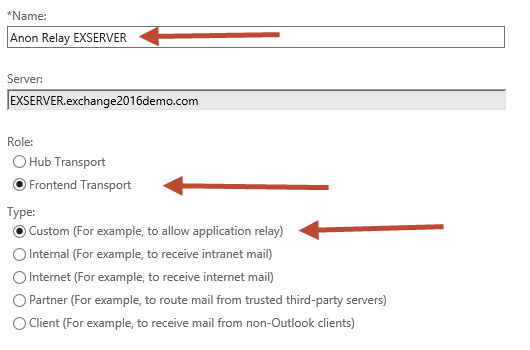 When authenticated SMTP is not an option you can create a new receive connector on the Exchange 2016 server that will allow anonymous SMTP relay from a specific list of IP addresses or IP ranges. 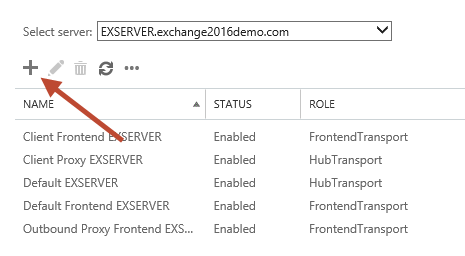 In the Exchange Admin Center navigate to mail flow and then receive connectors. Select the server that you want to create the new receive connector on, and click the “+” button to start the wizard. Give the new connector a name. I like to keep the name consistent with the other default connectors. Set the Role to “Frontend Transport”, and the Type to “Custom”. The default Network adapter bindings are fine. This represents the IP and port that the server will be listening on for connections. Multiple receive connectors on the Frontend Transport service can listen on the same port of TCP 25. Remove the default IP range from the Remote network settings, and then add in the specific IP addresses or IP ranges that you want to allow anonymous SMTP relay from. I do not recommend adding entire IP subnets that contain other Exchange servers as this can cause issues with server to server communications. Click Finish to complete the wizard, then there is some additional configuration still required. In the Exchange Management Shell run the following two commands. We can now test the connector using Telnet from the IP address that was added to the remote network settings of the receive connector. In my test environment that IP address will now be allowed to send email from any email address (whether it is a valid internal address or not) to any external address. ¿Do you like this page?